Roon 1.3 (Build 259) Is Live! A new release of Roon is rolling out to all platforms! Today’s release makes it easier and faster to play your music in Roon, and includes new DSP features courtesy of our friends at Audeze. We’ve also made significant performance improvements to our convolution engine, and a number of bug fixes are also included in this release. The full list is below. Roon Build 259 is now rolling out for OSX, Windows, Windows (64 Bit), and Linux. Updated versions of Roon for Android and iOS have been submitted to their respective App Stores and will be available upon approval. Build 112 of Roon Bridge is also live for all platforms. All platforms and apps should update automatically. After over two years of feedback, questions, and requests, tonight’s build includes some improvements to how you play music in Roon. The full screen play buttons have been replaced with with controls that we hope will be easier to use on both desktop and touch, both for “queue builders” and “one click players”. We’ve also added One-Click Play buttons across the app. 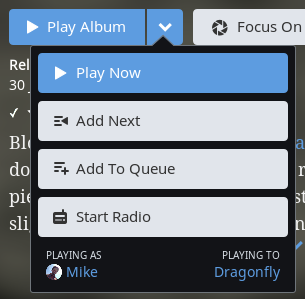 Anywhere you see a track, you’ll also see a small play button that will function like our previous Play Now button, but by default will also queue the rest of the tracks on the screen (also known as Play From Here). This is one of a few changes we are planning, including additional changes to the queue, so please let us know how these changes are working for you! We are thrilled to announce our new partnership with Audeze, who manufacture an incredible line of planar magnetic headphones and accessories. Once you’ve selected your Audeze headphone model in Roon’s DSP engine, a calibration filter will be applied. These filters were carefully designed by Audeze to provide an optimal and natural listening experience for each of their headphone models, similar to a pair of tonally neutral reference monitors in a well treated room. For more information on how to use Audeze Presets, check out the knowledge base. Since launching our convolution feature in Roon 1.3, we’ve never been totally satisfied with the performance. While it worked for many people, others ran into limits when handling DSD content. For this release, we’ve replaced the performance-critical FFT (Fast Fourier Transform) component–the heart of the convolution engine–with an implementation that fully takes advantage of hardware acceleration features available on today’s x86 and x64 CPUs. In many cases the new engine is over 10x faster than the old one, so if you had some trouble with convolution performance in the past, be sure to give it another shot.